"John Carter, Warlord of Mars relentlessly searches for his mate, the incomparable Dejah Thoris, across the hostile Martian surface, pursuing the dastardly villain who has abducted her and fled to a distant city. 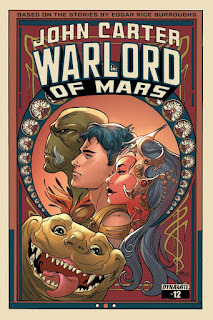 John Carter must fight his way through monsters and men to rescue Dejah Thoris from the evil designs of her captor. The city contains numerous hiding places and secret passages from which our hero must ferret out the prize. Playing cards for Random Events, Movement, Acquisition, and Maneuver both hinder and help him as he continues his valiant quest. Simple probability charts determine the outcome of each exciting twist of events in the game." 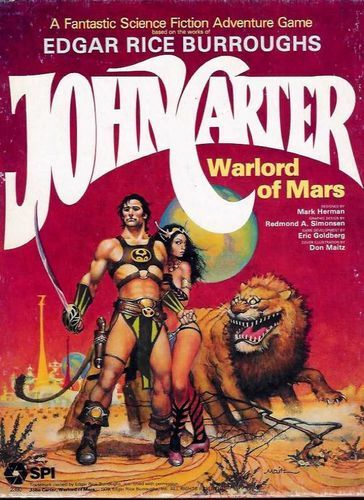 Probably the most interesting thing is, outside of the various comic books, this was the only licensed John Carter of Mars release for a long time, at least until the Barsoom action figures released as part of the Tarzan: The Epic Adventures toy line in the mid 1990s. With the new game coming out I wonder how much more interest will be in this game and if it will be republished at some point (especially since the one available copy for sale on Amazon is going for a 130 bucks). For a more in-depth look at this game check out https://boardgamegeek.com/thread/1155176/capsule-overview-game-component-manifest and stay tuned.